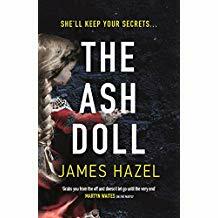 The follow-on from his well received The Mayfly, James Hazel’s The Ash Doll is an intricate and gripping thriller that like its protagonist, solicitor Charlie Priest, proceeds in unexpected ways. The author was himself a practising lawyer and his plot moves smoothly from courtroom to the hunt for the truth behind Priest’s current case. The novel opens with a chilling scene of a young girl standing perilously near the cliff’s edge and the policewoman who inches her way forward trying not to startle her. But there is something strange about the child... That was in 1989. Then the time and scene change to the present day and the opening of the case of the Elias Children’s Foundation against a small independent magazine, The Real Byte for libel. The newspaper’s barrister is waiting – but the chief witness whose testimony can make or break the defence’s case is missing. The defence’s solicitor, the idiosyncratic Charlie Priest, sets out to find him, a hunt that leads him into a world of depravity and danger, in which The Ash Doll of the title plays her role. A readable and chilling thriller, from its courtroom exchanges to its horrifying outcome.